August can be a hot and brutal month in our region, but fortunately, it is also a great time for watermelon! 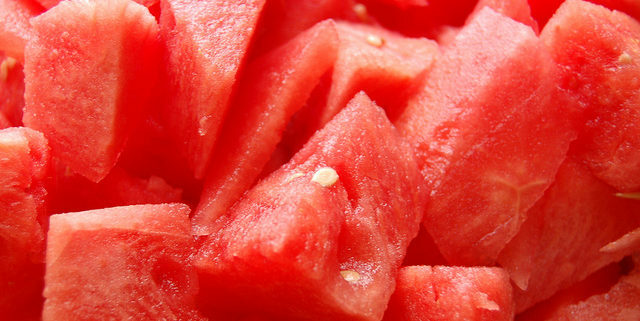 Watermelon is an excellent and sweet way to stay hydrated during hot summer days. At Orr’s Farm Market, we get a lot of questions about how to choose the juiciest, sweetest watermelon for your family and friends. As experienced watermelon growers (and watermelon lovers), we have a few tips that can help you choose your watermelon like a pro! Have you ever heard of the “field spot?” This refers to the yellowish spot of the melon that rested on the ground during its growing months. The ripest watermelons will have a creamy yellow or orange spot – not white. Selecting a watermelon with a field spot that is closer to yellow than white will ensure you have a ripe melon. re indications that bees have pollinated the fruit. More webbing means more pollination which will yield you a sweeter tasting melon. Did you know that farmers differentiate watermelons based on gender? Boy watermelons are bigger, a bit more elongated and have a waterier taste. Girl watermelons are smaller, more rounded and are usually sweeter. The size of your watermelon can also provide a clue about its flavor. You want your melon to feel heavy for its size. We recommend the Goldilocks approach to size selection – don’t choose the largest watermelon of the bunch, but don’t choose the smallest either. Something in the middle is usually just right. The last feature we inspect is the watermelon’s “tail” or stem. A dried tail indicates that the melon is ripe. If the tail is still green, it likely means that the melon was picked too soon and will not be ripe. We hope these tips will help you find the perfect melon for you, but don’t hesitate to ask us for assistance the next time you visit us here at Orr’s Farm Market. We are open Monday through Saturday from 8 am to 6 pm and on Sundays from 10 am to 4 pm. We look forward to seeing you! From now until the around the end of September, peaches are in season! Bring on all the peach pie, cobbler, smoothies, breakfast tarts, and more! We often get asked about the difference between some of our peach varieties and the best way to can or freeze peaches so you can enjoy them all year round. Take a look at these explanations and tips we’ve compiled for you to help you better navigate peach season! Clingstone peaches are peaches that tend to hug the stone, or pit, making them more difficult to remove them from the pit. Freestone peaches separate more easily from the pit, making it easier to pull out once the peach is halved. We tend to carry clingstone peaches earlier in the season typically because they are ready earlier in the season, then transition to semi-freestone, and finally, end with freestone peaches. Prepare light or medium syrup. Simply heat water and sweetener in a saucepan until sugar dissolves. Place peaches in boiling water for 30 seconds to 60 seconds. Immediately remove the peaches, place in a sink or bowl with cold water to blanch. Slice the peaches in half and remove the pit. Skins should peel right off. Use a knife for the stubborn spots. Place peached in jars and cover immediately with syrup. Wipe the rim of the jar clean, remove any air bubbles and place your lid. Cut the skin on the peach. This allows for expansion when you blanch the peach. Bring a large pot to a boil. In a separate bowl, fill with ice water. Place 3 to 4 peaches in the boiling water and remove in 30 to 60 seconds. Place peached in ice water immediately after removing from boiling water. Use a knife or your hands to peel peach skins from each peach. Half each peach, and remove a pit. Slice peaches to desired size. Prepare peaches for freezing. There are three options below. Water Pack – Pack peaches into a pint- or quart-size freezer container or bag, leaving 1/2-inch headspace for pints and 1-inch headspace for quarts. Pour water over the peaches, maintaining the specified headspace. Sugar Pack – Pack a short layer of peaches into a pint- or quart-size freezer container. Sprinkle lightly with sugar; repeat layering, leaving 1/2-inch headspace for pints and 1-inch headspace for quarts. Cover and let stand 15 minutes or until juicy before freezing. Syrup Pack – Prepare desired syrup. Pack peaches into a pint- or quart-size freezer container or bag, leaving 1/2-inch headspace for pints and 1-inch headspace for quarts. Pour syrup over the peaches, maintaining the specified headspace. Very Light Syrup – Use 1 cup sugar and 4 cups water to yield about 4 cups syrup. Light Syrup – Use 1-2/3 cups sugar and 4 cups water to yield about 4-1/4 cups syrup. Medium Syrup – Use 2-2/3 cups sugar and 4 cups water to yield about 4-2/3 cups syrup. Heavy Syrup – Use 4 cups sugar and 4 cups water to yield about 5-3/4 cups syrup. Seal and label containers. Place in freezer. When you are ready to use the peaches, take them out of the freezer and place them in your refrigerator or a cool water bath. Then enjoy! Come get your fresh peaches today! Our summer hours are 8 a.m. – 6 p.m. Monday through Saturday or 10 a.m. to 4 p.m. on Sundays. Not up for picking your own? We have pre-picked peaches in our market. We look forward to seeing you here! You worked hard all winter long to be able to lose those stubborn pounds and get your body summer-ready, don’t lose it now that summer is here! 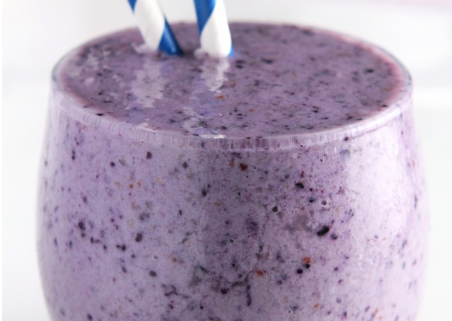 This smoothie is great for a mom (or dad) on-the-go or just someone who wants to relax poolside. It is low in fat and calories, but high in protein so you will be able to fight off your cravings and keep the munching to a minimum. Add all of the ingredients to a blender in the order listed, and pulse until smooth. Serve immediately. This smoothie is meant to be thick, so you can adjust the ice amount to meet how you like your smoothie. Come get your fresh blueberries at Orr’s Farm Market! Our summer hours are 8 a.m. – 6 p.m. Monday through Saturday or 10 a.m. to 4 p.m. on Sundays. Our blueberries are available to pick-your-own or are pre-picked and can be found in the market. Our blueberries are $3.29 per lb for up to 10 lbs and $3.09 per lb for 10 lbs or more. Happy picking! With it being National Blueberry Month, we were curious about what makes these tiny fruits so special. I mean, what about blueberries is so significant that they have an entire month dedicated to them? We did some research, and it turns out this “superfruit” is packed full of nutrients, making them delicious and great for you! Take a look at the top health benefits of blueberries. Antioxidants are compounds found in the body that is used to protect cells from damage, as well as from chronic illness like cancer, diabetes and heart disease. Compared to other berries, blueberries are highest in antioxidants. According to WebMD, one cup of blueberries has enough antioxidants in it to fulfill your daily need. All around, the nutrients in blueberries make them a great addition to your diet. With 3.6 grams of fiber per cup, this amount of blueberries takes care of fourteen percent of your daily fiber needs. Fiber makes you feel fuller longer and keeps your digestive tract regular and on pace. Blueberries help improve memory and cognition, boosting your brain health to new heights. Again, with the antioxidants, these tiny fruits protect the brain from damage and help it to age in a healthy way. So munch on a few blueberries during lunch to keep your brain focused through the workday. With coronary heart disease being one of the leading causes of people in the United States, including blueberries in your diet can improve your overall heart health. Your heart pumps blood throughout your entire body, so it’s vital in keeping you alive and healthy. Eating blueberries regularly can result in lower blood pressure and lower LDL cholesterol, both important in keeping your heart healthy. With all this talk about blueberries, it’s time to visit us at Orr’s and get some for yourself! You can pick-your-own blueberries or select from our pre-picked ones inside the market. We have five varieties, each variety with its own flavor and size. Our summer hours are 8 a.m. – 6 p.m. Monday through Saturday or 10 a.m. to 4 p.m. on Sundays, so pick some while you can! July is National Blueberry Month, so at Orr’s we feel the need to celebrate these small fruits accordingly. Packed full of antioxidants, blueberries are great for losing weight, fighting off disease, and are delicious too! From breakfast to dessert and every meal in between, here are an assortment of recipes that will help you to include more blueberries in your diet. For breakfast, start your morning off on the right foot with these yummy Fruit and Cream Cheese Breakfast Pastries! With blueberries ripe and ready this season, their sweetness pairs so well with the smooth cream cheese spread. Sure to satisfy, this combination of savory and sweet is perfect for lunch. A spin on a classic grilled cheese, this Balsamic Blueberry Grilled Cheese Sandwich is sure to delight your taste buds. Snack time is a great time for more blueberries! And these Frozen Yogurt Covered Blueberries hit the spot when you get hungry for an afternoon snack. The blueberries give you some antioxidants for an extra bit of brain boost while the Greek yogurt keeps you full until dinnertime. Dinner is the main meal of the day in most households. It’s a meal where everyone comes together and talk about their day over a fresh, delicious meal while spent enjoying each other’s company. This Best of Summer Kale Salad and Blueberry-Balsamic Vinaigrette is an easy, but healthy recipe that tastes just like summer. You can always add chicken on top too for some extra protein! Dessert, the best meal of the day! And this light and fluffy Blueberry and Cream Angel Cake is sure to handle your sweet tooth without being too heavy. This recipe is simple to make and your family will be sure to love it. With all this talk about blueberries, come on down to Orr’s and pick your own! Or purchase some of our pre-picked blueberries in the market. Our fresh berries are sure to compliment any and all of these recipes above, or eaten just by themselves. Come get your fresh blueberries today! Our summer hours are 8 a.m. – 6 p.m. Monday through Saturday or 10 a.m. to 4 p.m. on Sundays. Our blueberries are $3.29 per lb for up to 10 lbs and $3.09 per lb for 10 lbs or more. Happy picking! https://orrsfarmmarket.com/wp-content/uploads/2018/07/Blueberries-e1530623013295.jpg 800 1067 Orr's Farm Market https://orrsfarmmarket.com/wp-content/uploads/2017/03/Orrs_WebHeader_2017-1.png Orr's Farm Market2018-07-05 09:45:472018-07-03 09:05:09July is Here, it’s Time for Blueberries! I think we all remember that Ram Truck’s “So God Made a Farmer” commercial that rocked America from the 2013 Super Bowl. It features Paul Harvey’s like-named speech from 1978, eloquently telling the story of how God needed someone to take care of his planet, someone strong enough to fell trees, tough enough for all the back-breaking work, and gentle enough to tend to his animals. If that commercial didn’t strike a chord with you, then you might need to get a little dirt on your hands. America was built on farming. When colonists came over from England, there were no perfectly plowed fields with abundant crops waiting for them. They had to get their hands dirty, grow their own food, raise their own animals, and put in all the work necessary to sustain their communities. Once they did that, they moved on to farming crops that would later build empires. In this way, farming became, and remains, the backbone of America. Farmers are the foundation of their communities. They are the backbone of America – without them, our land and our economy would fall to pieces. Local farming allows community members access to fresh, local food, and it in turn helps them support farmers in their community. As farmers, we make sure we produce quality food so that it can end up on your table. We continue to build upon this foundation today. When you think of farmers, you might think of cowboys from the Old West, driving cattle across wide open plains, or maybe you think of a corn field that stretches as far as the eye can see in the Midwest. But farming is happening nowand it is happening everywhere. Even here and now, in the eastern panhandle of West Virginia. When you pour milk into your morning cereal, you can thank a farmer. When you slice open a bright red watermelon for your Fourth of July cookout, you can thank a farmer. When you choose a leafy green salad for lunch, you can thank a farmer. For every food you have in your home, you can thank a farmer for all the back-breaking work they put in seven days a week, 12 months a year. Farmers don’t take vacation days. And for that, you can thank a farmer. 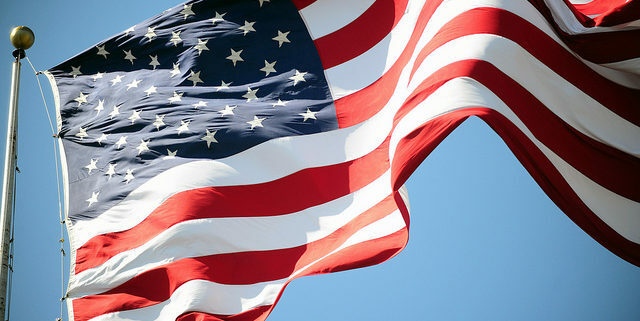 America is a land built on freedom, but it was built by farmers. Be sure to thank all your local farmers this Fourth of July! https://orrsfarmmarket.com/wp-content/uploads/2017/05/7343032302_1ac2e982dd_z.jpg 427 640 Orr's Farm Market https://orrsfarmmarket.com/wp-content/uploads/2017/03/Orrs_WebHeader_2017-1.png Orr's Farm Market2018-06-29 12:25:112018-06-14 12:33:20Thank A Farmer This Fourth! One of our favorite things about summertime is our Blue Grass weekend performances. There’s just something so fun and entertaining about hearing those guitar and banjo players picking and strumming away while you’re enjoying yourself on a bright sunny summer day in the countryside. Our Blue Grass weekends are a wonderful way to spend the day with your family. You can come out to the market to hear some of the region’s best bluegrass music while shopping, picking your own fresh fruit, or simply relaxing in the summer sun. Sounds like a perfect weekend plan to me! As always, we invite you to bring your own lawn chairs and enjoy some free entertainment. You won’t want to miss it! 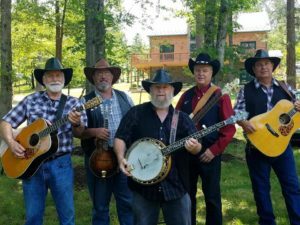 We are hosting Ernie Bradley & The Grassy Ridge this Saturday and Sunday! Each Blue Grass weekend performance runs from 11am to 4pm. With no holidays these next few weekends, celebrate the summer by coming out to hear the live music, enjoy delicious farm-fresh food, and shop for local, healthy goodies. The Martinsburg Lions Club will also have their food booth open during these weekend performances, so be sure to grab a hot dog and support a great local organization! We hope you’re picky about your weekend entertainment – so come see our bluegrass performers do what they do best! To see a complete listing of our 2018 events, click here. https://orrsfarmmarket.com/wp-content/uploads/2017/03/Orrs_WebHeader_2017-1.png 0 0 Orr's Farm Market https://orrsfarmmarket.com/wp-content/uploads/2017/03/Orrs_WebHeader_2017-1.png Orr's Farm Market2018-06-21 10:40:212018-05-31 16:36:56Be Picky This Weekend! It seems like there’s a national day for everything nowadays! This month, it’s National Fresh Fruit and Vegetables Month, and with it being right smack in the middle of June, there are plenty of fruits and veggies for you and your family to enjoy. As there are simply too many recipes to choose from for this month, we’ve included some of our favorites from Pinterest and Better Recipes for you and your family to try! You can even pack these recipes all into one day! Start your day off with some apple butter pancakes!. These pancakes are sure to start your morning off right with the perfect amount of sweet and savory. For lunch, try the Santa Fe salsa salad. This recipe includes a LOT of in-season vegetables, like onions, peppers, sweet corn, tomatoes, and romaine lettuce. Sure to satisfy, fun to make, and great, nutrient-dense fuel for your body, you and your family are sure to love it! Try some Italian sausage stuffed peppers for dinner to get some more peppers and tomatoes that are in season and ripe to perfection. Click here for the recipe! If you’re craving something a little sweet after dinner, try crescent roll apple dumplings or strawberry jam muffins! They’re the perfect sweet treat to end the night, and they’ll be even more delicious knowing these ingredients are at the top of their game this June! Not sure where you can find the best apples, preserves, or apple butter? Come down to Orr’s Farm Market! 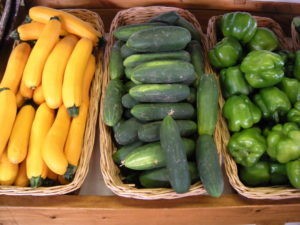 Our market has the perfect wholesome ingredients to make your recipes as healthy, delicious, and local as possible! We’re open seven days a week, so be sure to check our hours online before coming in. If you can’t find the time to come in, you can even shop our market online here! https://orrsfarmmarket.com/wp-content/uploads/2017/03/Orrs_WebHeader_2017-1.png 0 0 Orr's Farm Market https://orrsfarmmarket.com/wp-content/uploads/2017/03/Orrs_WebHeader_2017-1.png Orr's Farm Market2018-06-15 02:30:542018-05-31 16:36:22June is National Fresh Fruit and Vegetables Month! Father’s Day is just around the corner, summer is almost here, and it’s just about time for sweet cherry season! Picking fresh sweet cherries is half the fun, and eating sweet cherries is the other half! Not sure where to put them? Look no further! We have the perfect sweet cherry recipe for you and dad to enjoy this Father’s Day. In a separate bowl, add the maple syrup, coconut oil, and milk. If your milk isn’t room temperature, stick it in the microwave. If it’s too cool it will harden the coconut oil. Add egg and wet mixture to dry ingredients. Mix until smooth. Add cherries. Fold until combined. Grease muffin tins and add batter. Baked for 22-25 minutes (or until toothpick comes out clean). Juice lemon into a bowl. Add and whisk sugar in until it forms glaze. Drizzle the glaze on top of your muffins just before serving for a satisfying, delicious treat that you and dad will love. Did you know it’s sweet cherry season here at Orr’s Farm Market? 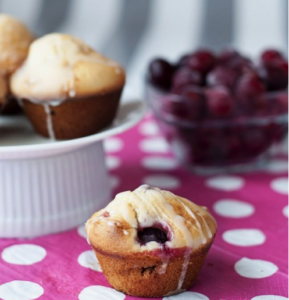 Be sure to stop by to pick your cherries fresh for this recipe! You can make a whole day of it! Because what dad really wants this Father’s Day is to spend time with his loved ones. Our summer hours are back in session! Stop by any time from 8 a.m. – 6 p.m. Monday through Saturday or 10 a.m. to 4 p.m. on Sundays. We can’t wait to see you! Happy Father’s Day from all of us here at Orr’s! https://orrsfarmmarket.com/wp-content/uploads/2017/03/Orrs_WebHeader_2017-1.png 0 0 Orr's Farm Market https://orrsfarmmarket.com/wp-content/uploads/2017/03/Orrs_WebHeader_2017-1.png Orr's Farm Market2018-06-08 09:00:402018-05-31 16:36:06Cherry Lemonade Muffins – Perfect for Dad! It may have taken Mother Nature a little longer than usual to make it feel like summer, but that hot weather is finally here! What’s the perfect snack to help you and your kids stay cool this summer? Popsicles! And what better, refreshing, summery popsicle than pink lemonade! Follow this super easy recipe for fun and deliciousness the whole family can enjoy – guilt free. Combine coconut water and pink lemonade. Set aside. Add about 1/4 teaspoon of zest to each popsicle mold. 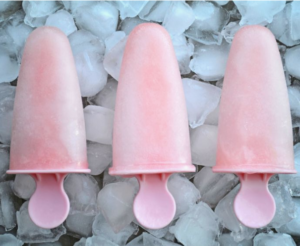 Slice strawberries lengthwise and place in your popsicle molds (approximately one strawberry per popsicle). Pour coconut-lemonade mixture into molds, secure lids in place, and position popsicle sticks. Freeze 4-6 hours, or until completely solid. Such an easy recipe for such an enjoyable treat! Be sure to stop by for your fresh strawberries to ensure this recipe has the perfect pop for you and your family. Don’t forget that our hours have officially changed! We are now open from 8 a.m. to 6 p.m. Monday through Saturday, and 10 a.m. to 4 p.m. on Sundays. Stop in and say hi! We’d love to see these popsicles! https://orrsfarmmarket.com/wp-content/uploads/2017/03/Orrs_WebHeader_2017-1.png 0 0 Orr's Farm Market https://orrsfarmmarket.com/wp-content/uploads/2017/03/Orrs_WebHeader_2017-1.png Orr's Farm Market2018-06-02 09:30:002018-05-31 16:39:16Pink Lemonade Popsicle!